Last Friday the University of Maryland had an open house for their robotics department. This was a free event, including lunch, and very well organized. I had not been able to go to any previous robot competitions at the university so I was eager to see what they had. The university has 18 robotics labs, 16 of which were open for tours. They spend approximately $15M per year on research. The day started with a keynote presentation by iRobot, best known as the inventors of the Roomba, a robot that can vacuum your home. This device has sold in the millions. But the most interesting part of the talk centered on various military projects, where sales of a few thousand are considered highly successful. 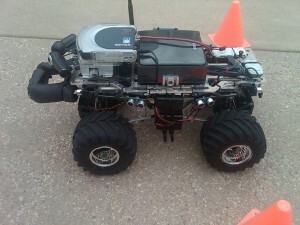 iRobot is working on mine detection robots and robots to help sample and clean up the Gulf oil spill. Lots of cool videos. They were a little spare on details, but all I can say is that it looks like a fun place to work. The first tour I took was on the plaza of the engineering building. 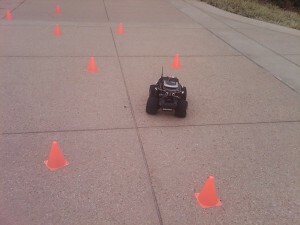 There were several robots navigating their way around some orange cones. Next up, I had seen a blurb for flying robots controlled by brainwaves. This was too good to miss. The traditional media agreed with me — a cameraman from Channel 9 was there. (He even asked me a few questions, though I don’t know if I ever made it on air.) As it turned out, the brainwaves were a small part of the control system. A standard remote-control setup did most of the work. But control of the altitude or the yaw could be turned over to a human subject wearing a headset that does a primitive EEG. By concentrating, the subject could change his brainwaves in one direction or another. This is a monotonic control function, and so, can’t really do much. The goal is to be able to send the robot somewhere by looking in a particular direction…don’t know if they can do this with brainwaves alone as opposed to eye tracking, but it’s an interesting idea. Another highlight was the Neutral Buoyancy Facility. This is a three-story building with a giant water tank occupying the center. Underwater robots swooped and dived as we watched. The facility can be used to design underwater robots and to simulate the weightlessness of outer space. 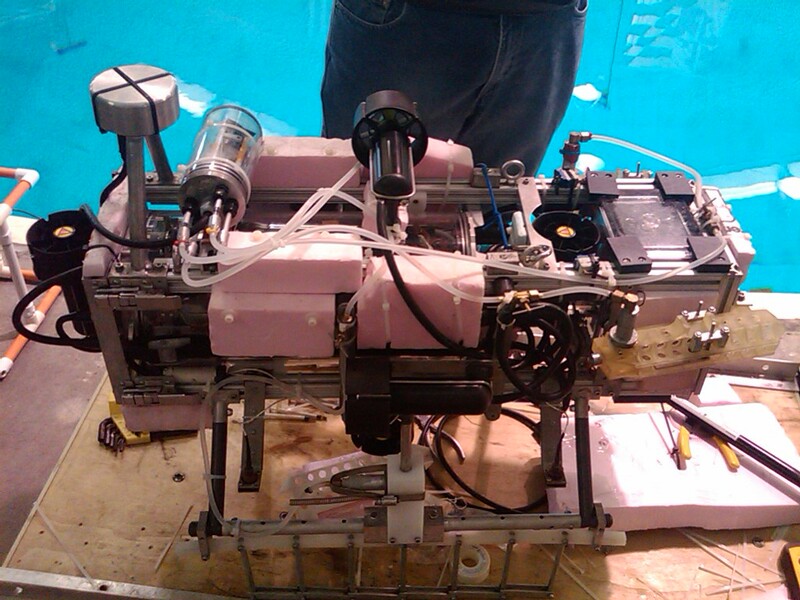 The robot shown here is Tortuga 3, which has won a number of important competitions. It was not running today, however, because the on-board computer was showing a disturbing tendency to shut down unexpectedly. The thrusters still continue to function in that case, which can lead to an irreversible dive. (Sounds like a design flaw to me.) This allowed us to take a closer look at the fascinating machine. Building a land robot is pretty hard; making one that is waterproof too is very impressive. Finally, here is a close-up show of componenets used in a tandem helicopter. They will look familiar to many hobbyists: SparkFun, XBees, and RadioShack perfboard. It is heartening to feel a kinship with cutting edge research. 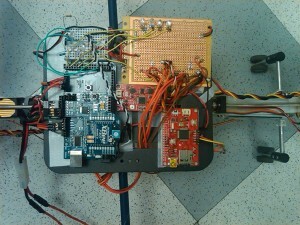 Note the XBee (blue), SparkFun board (red), and RadioShack perfboard (yellow)! All in all it was a great day and the price couldn’t be beat. For more photos and details about the visit, please see my Facebook album. Thanks for your write-up and I think you did make it into the WUSA 9 report! This was reposted in Make:Online.